Historically, I haven't been someone that wins many contests, but my luck has been getting better lately! 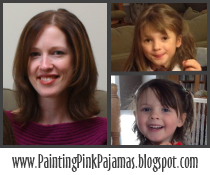 During the Ultimate Blog Party I won two prizes, which was a very pleasant surprise! A handmade bunny named Mopsy arrived a couple of weeks ago from Nicole at 60 Piggies. C fell in love with him right away, and she's slept with him many nights since (C has decided it's a "he" instead of a "she). Check out her blog for gorgeous photography and her etsy shop (SweetTeaShoppe) for beautiful handmade goods! Today I also received a box from the Laugh-Friendly Company containing two books and two dolls. We read the book about Chatterbox, The Bird Who Wore Glasses at naptime; it was cute. I've only flipped through it so far, but the Classic Fire Trucks book looks fantastic! C is a bit young for it, but she loves fire trucks, so I think she'll like it. It describes what each truck does, firefighters' gear and their duties. We received two Cutie Patootie dolls: a swimmer and a boat captain. They're small dolls, and I think they'll be great new travel toys to bring when C and I go on a road trip together next week! Here are a few giveaway sites to test your luck and inspire some online shopping! have a wonderful week with your little gal.